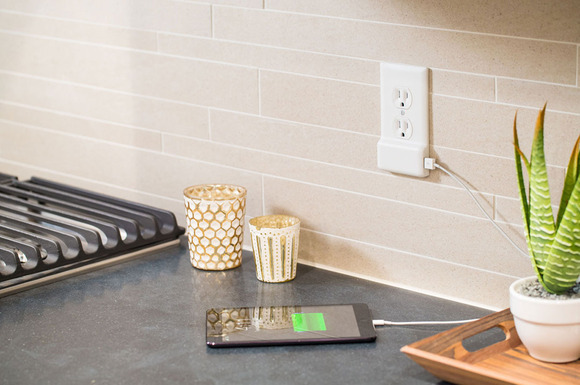 If your home is like ours, all of the most convenient electrical outlets have been claimed by USB charging ports. The folks at Snap Power have come up with a clever way to provide a charging plug while saving power outlets for important things like lamps and toasters. The Snap Power Charger is a replacement outlet cover that incorporates a USB socket just below the AC outlets. You don’t need to mess with the actual power outlets or touch the wiring behind the plate. The Snap Power cover has a pair of prongs that slide into the outlet space and touch the screws on either side of a standard dual plug. To be safe, you should turn off the electricity feed to the outlet before you install the new cover. You might also check to be sure prongs can make a clean content with the screws. The Snap Power plates work with most standard two-socket outlets, but not with GFCI outlets, the ones that have built-in reset buttons and are often used in bathrooms. The plates cost $20 each at the Snap Power website. The price goes down if you buy more than one and they are available in with round our rectangular holes and in three different colors.